Actually, I think he got a Visa in order to travel to Israel, but he got Vista on his new computer. Our friend and blogging guru of Tioga and George is on his way to Israel for a non-RVing travel experience. Before taking this jaunt, he determined that he needed a new computer. He planned a layover in Miami and ordered a computer to replace his 3 year old laptop, 'Ms. GQ.' The new computer was shipped to our address, and we spent the day today with George and his new computer. It's more work than one might hope to transfer all the important stuff from one computer to another. After several hours, both Jim and George seemed pretty happy with the results - a good sign! 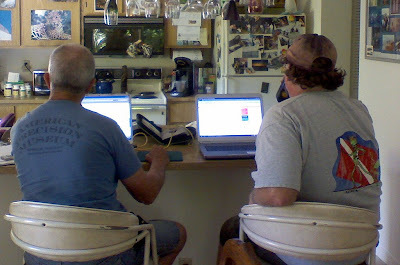 Here they are, hard at work at my Mom's house. I was a little worried (hey! that's my job.) Getting a new computer before an overseas trip is kind of like getting new boots before a big backpacking trip .. you might be in for a lot of blisters. I get a real charge out of the comments on George's blog referring to his purchase of a computer with Vista. Apparently, you either love it, or you hate it! I have a Vaio with VISTA. Love it. Works great with my programs. Easy to use. .. get a copy of WinXP Home. Remove Vista. The only way to have compatibility. Vista is a bust. ... Vista ... works sooo much better than XP. You need to learn how to use it. ... I am back on XP after VISTA and now I am looking at UBUNTU but lets not get started there. I love Vista. It really helps me, as I am not computer savvy! Why not just get a MAC!? I'm somewhere in the middle. I accept Vista. I try not to get emotionally attached to operating systems - they keep changing! It still locks up on me about the same amount that XP did, but I know I can do things on my computer now that I could never have done before Vista. Like editing one video, viewing another video, working on a web page with Dreamweaver, receiving email, and entering data in an Access database, all at the same time. It's all a process. On to the next adventure! We'll be watching you George. Kinda like a grandparent is proud of the grandkids and wants to show pictures of them - that's how I feel about these blogs. I didn't have anything to with them, but my teaching did help in the 'birthing' process. Hmmm, does that make me a Blog-midwife? :-) These two bloggers sent me emails this week with links to their blogs ... so, I just have to show you. Mike and Pat's Blog. Mike used my videos to master the art of map-making! Travels with Lucy included their first video this week! Odie is SO proud of you Lucy! WordPress is another, very popular, blogging platform. We teach people how to use Blogger because it is easier, but I like to keep checking in on WordPress so I stay informed on the alternatives. I just helped a friend get set up on WordPress and I'll stick to my original assessment ... Blogger is easier! 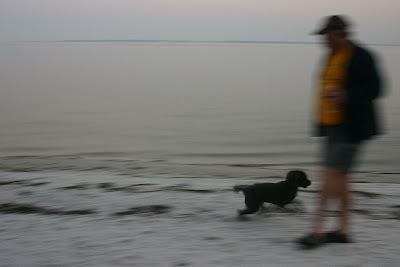 I have my own blog on WordPress, http://www.wifisavvy.com/ and I find that I don't post very often. That's probably just because I'm lazy, but it's also partly because I'm not very comfortable with the structure. 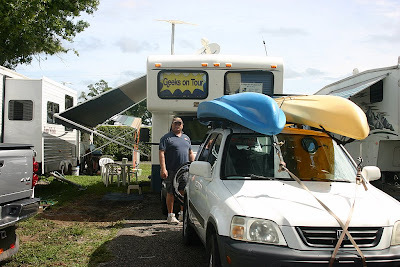 My weekly post to the RV.net blog is also done on WordPress. It is certainly not difficult, but it's clearly more difficult than Blogger. So, why even consider WordPress? It has more features than blogger. You can create a complete website with multiple pages using WordPress. There is one, very cool feature of WordPress that I had been meaning to try ... you can import entries from other blogging platforms into a WordPress blog. I'm always looking for a way to back up this blog effectively, could this be the answer? I gave it a shot. It only took a few minutes to set up the account and the blog. I went into the management area and clicked on Import and chose 'import from a blogger blog.' After identifying my blogger account, I saw this blog listed - all 962 posts. Certainly it's going to choke on this. Nope. It took about 15 minutes to import the whole thing. So, I now have a 'mirror' blog over on WordPress. How cool is that! You can check it out at odiesroadies.wordpress.com. This method does not make a backup copy of the pictures, it just backs up the written posts, including the links to pictures. I teach another way to backup if your purpose is to be able to have your entire blog on a CD or some other offline backup. See my video on how to backup your blog. Diane beat me to the punch! We had a great visit with Diane and Andy the other night, and I haven't even gotten the pictures out of the camera yet. Diane has already posted about it to their blog! So, I'll just refer you there. Thanks Diane! "Hey Mikey! They LIKE it!" Remember that commercial? Well, I think people liked the Google Earth video I posted on the RV.net blog yesterday. At the end of the post I suggest that people can see more video by visiting our website at GeeksOnTour.com. I checked my Google Analytics statistics page and see that visits to Geeksontour.com were double the normal number yesterday. hmmm - that last spike was exactly one week ago ... and I post to RV.net every Thursday ... interesting. We also had a spike in Newsletter subscriptions yesterday. Instead of the 1-3 per day that come in when nothing is going on, we had 17. Cool! That brings our total to over 1300 now. The newsletter is free, but developing a following like that is what will enable us to charge small amounts for our videos and have it add up to something. This spike in readers is still nothing like what we got when George mentioned us though. Speaking of George, we expect to see him next week as he passes through Miami on his way to Israel. I don't know if we'll recognize him without Ms. Tioga! He is leaving his motorhome in Mexico while he takes a trip to Israel for a few months. That George is such an adventurous guy. At first this was a 'personal' blog only. I used it like a journal, I wasn't even sure I would tell anyone it was there. Well, maybe just family and close friends. Then, I wrote a little about the work we were doing. Hmmm, is this a personal blog or a business blog? I finally decided that it's both. That is a great thing about our lives, we blend personal and business. We love what we do and we do what we love, and we write about all of it! So, with this blog post I am re-deciding to write something about our vocation - Computer Education for Travelers, as well as our avocation - living and traveling via RV. I write every Thursday for RV.net's blog. Last Thursday I wrote about how to make a map of visited states. If you want, you can see all the articles I've written for RV.net blog. And last, but definitely not least (I actually get paid for this one!) I'm writing another article for FMCA magazine. If I can get it done soon, it may even make the July issue, just in time to promote the fact that we'll be giving our seminars at the FMCA National Convention in St. Paul Minnesota. In my last post, I commented how much I enjoyed the greenery here in S Florida. Emily's yard really shows it off. She invited me, Jim, Mom, Chris L, and Richard over for dinner. Emily has become quite an accomplished watercolor artist, winning many prizes at local shows, and even selling some paintings for $$!! Emily, we really must update your website! Here she is with a painting inspired by one of our photos from Big Bend. But, the real work of art was dinner. Paella! Thanks Emily! What's that old saying? "Travel the world and find happiness in your own back yard." or something like that. It's so good to see green! (grass and trees that is ... money is another story) The weather has been gorgeous. It's a perfect 76 degrees outside right now. And, everywhere we turn, we see another old friend. I went to my Women's Executive Club luncheon the other day and got so many hugs! Some of these women I've known for 25 years. Speaking of diving. We volunteered with our Kayuba dive club to work at the Ocean Fest event this weekend. 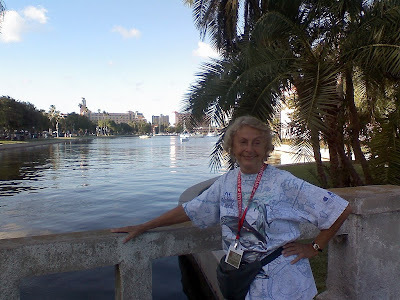 The event is held right on Fort Lauderdale beach: My mom, Marilyn and her brother, my Uncle John, were also volunteers; Jim took a little time off to enjoy the sights: I'm sure looking forward to a kayak dive soon. We've been awfully busy so far though. Jim is working in the office here at Paradise Island 3 days/week. I had four different appointments this week with old clients and new. 2 for website work, 1 for database programming, and one for good ole computer tutoring. And, in my spare time, I'm trying to get our Geeks on Tour website ready to become a membership website. That's my long term plan for making a living. I'm working on new video tutorials for Photostory 3 and for Windows Vista. When I get them done, I believe there is enough value there to start charging for the videos. Oh - one last thing - I added a 'shoutbox' to the right sidebar here. This is an easier way for you to leave comments on this blog. I first saw the shoutbox on George's blog and really liked it. btw - George has been blogging from Mexico for the last few months - wonderful stories and photos - check it out. He's going to Tulum today. Today, I noticed a shoutbox on Froggi Donna's blog and hers fit in the sidebar. So - I went and got my own. Leave a note and see how you like it. You need to create a name to post under, but that's all. It's *really* easy. I did my share of investing when tech stocks were hot in 1997-2000. That was fun. When they crashed in 2000-01 ... not so much. I never did learn when to sell. I really haven't cared much for investing since then. But, investing conferences are great. In order to learn what to invest in, you need to learn about what is going on around the world. Some of it is not so good ... shortage of water, food and oil is a major theme now. In investment-speak that means that commodities are hot. The other theme is emerging economies ... the BRIC countries - Brazil, Russia, India and China. They are all becoming more free, and with more freedom comes more economic growth. In investment-speak, that means own global stocks. But, the best part of the conference was getting to spend this much time with my Mom. 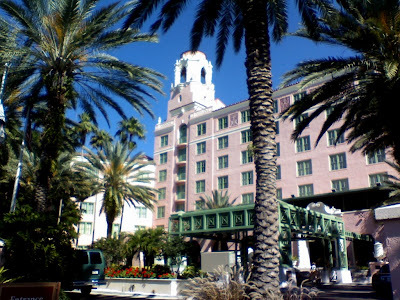 Even though we were in a hotel in St. Pete, Florida - it felt like we were traveling. We watched a piano recital by a Russian pianist, learned about resort properties in Nicaragua, and enjoyed a wine tasting of Argentinian wine. It was a beautiful hotel: We were in meeting rooms, listening to speakers most of the time, but we took a walk around the block a couple times and took a picture of each other: (more pictures if you click on any of those above) I love traveling. I mostly travel around this country, but thanks to Mom I have traveled to Chile, Ecuador, Turkey, China, and Borneo. Mom travels the world and she takes video when she travels. I help her edit the video and post short clips like this one of Namibia or this one of Bhutan. One of my goals for this stay is to help her edit the video of her last two trips; Central America and China-to-Tibet by train. We gotta get that done before she takes off on her next trip ... to western Australia. I had a great time being out of the RV world for a few days, and in the world of investing possibilities. I may have even learned enough to put my toe back in the investing waters - they taught us about a portfolio strategy so simple, you only have to trade once a year. Thanks Mom! 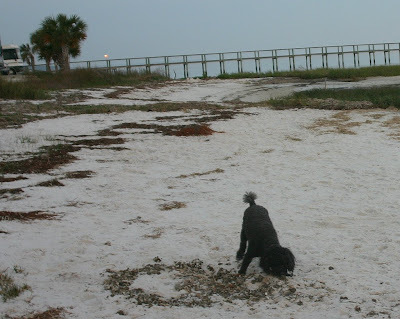 Chris and her Mom are in St. Pete for a conference, so it is up to me to do the fun stuff. Dr. Ray has a party this time every year. Ray is an Icon in the diving community and the guest list is a veritable who's-who of South Florida divers. We've known Dr. Ray for many years because of our membership in the USA Dive Club. The main dish is lobster, of course. Pork Bar-B-Que, Stuffed Shells, Lasagne, salads and more are on the menu. Not to mention the desserts. Yummm. The best thing is getting together with folks young and older, who we have known for quite a while. I'm staying at a hotel for a few days attending an investment conference with my Mom. I left Jim at home with Odie. 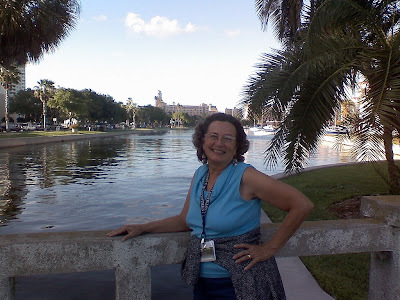 Mom and I are in St. Petersburg, Florida. It was about a 4 hour drive. Do you find that the cost of Internet service is directly proportional to the cost of the accomodations? This is an expensive hotel, and the in-room Internet service costs $15/day!! I had to have Internet today in order to get my weekly article for RV.net posted, so I paid the $15. But, I probably won't do another day, so you won't hear from me till I get back to Fort Lauderdale on Sunday. By pure coincidence, my article is about Online Banking. And, here I am listening to speakers talk about the great things available to investors online! If it weren't for the little ones, we might not even know that time has passed! 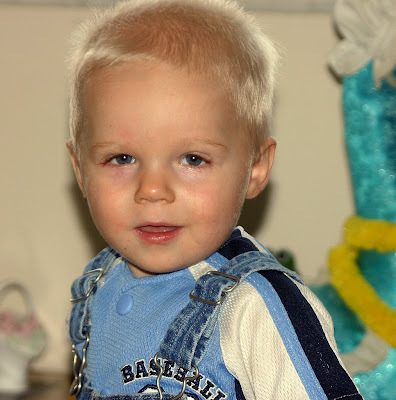 But, check it out - the last time we saw Jim's grandson, AJ - he had not yet taken his first step. Now he's a little over 1 1/2 years old and he's zooming around on those two legs! 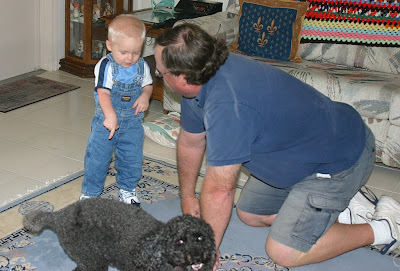 And, 'Gramps' is back on all fours :-) He's going to be a heartbreaker, dontcha think? Brad Pitt move over. 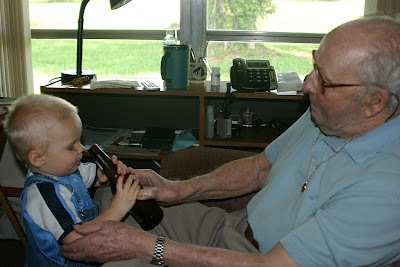 You hear how much grandparents spoil the little ones ... that's nothing compared to Great Grandparents! ooohh - what a bad influence?! We're Home now until the end of May when we'll travel to Branson, Missouri for the RV-Dreams rally. We are at home wherever our motorhome is, but this is Home. 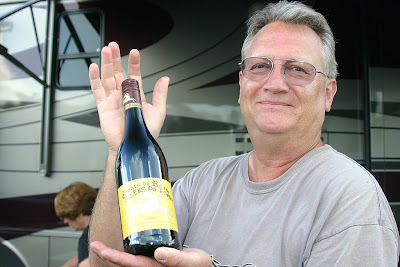 Both Jim and I lived in Fort Lauderdale for a little over 20 years before we started our fulltime RV lifestyle. The house we lived in, and sold in 2003, is just a few blocks away. My Mom is about a mile away from this RV park, and Jim's Dad is a couple miles. Jim's son and grandson are about 10 miles. So, yes, this is Home. We have lots of friends here too. It's going to be a busy 2 months! If you add up all the times we've been parked here at Paradise Island, it would probably total a year - maybe more. We were even here through hurricane Katrina! That was a rockin' good time! It's an old park and the sites are small. The original name of the park was Buglewood. It was built over 30 years ago when a 20 foot travel trailer was a 'big rig!' 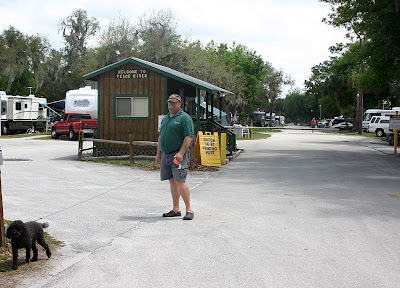 And ... it is one of a very few RV parks left in South Florida. Most have sold to make way for condos. This place is CROWDED. 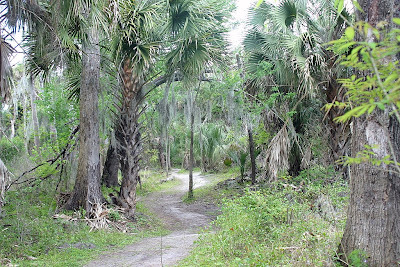 Especially compared to the luxury sites at Palm Creek, and the wide open spaces of Thousand Trails preserves where we have been staying. That's why we like to stay here in the summer time. Off-season is the only time there is space. We apparently arrived a little early this year -the park is still full. If you wanted to stay here next winter - you are probably already too late to make reservations! Much of the park is full of people from Quebec who have been coming here every winter for 30 years! As you can see from the photo, we just barely have room to put our awning out. We knew that the manager would move us to a better site as soon as one opened up. Sure enough, he called us yesterday to say that our favorite site was available! So we moved. At 8pm last night, we had a knock on our door. "You're in our site! We have reservations for this site. You must move." At least, I think that's what he said, French was clearly his first language. Jim told him, "No - we're not moving tonight." First of all, since Jim works in the office when we're here, he knows that the policy is NOT to reserve specific sites. When a park is this full, they need to option to put people wherever a site becomes available - they cannot make reservations on a site-specific basis unless the reservation is for the whole season. Second of all, I didn't think it was possible that an RVer would arrive well after dark and expect someone to move out of their site regardless of the mixup! Stay tuned, we'll see what happens. Later ... yes, we did move. After hearing their tale of woe, Jim decided it was a legitimate misunderstanding. No big deal for us to move - our second favorit site was open - and we'll move back when they leave in a few days. What a welcome! Peace River was our winter home for 2006-07 so we just had to stop by on our way to Fort Lauderdale and say hi. From the hugs by Suzy and Babette who checked us in, to the obligatory exchange of insults from Bob on his golf cart :-) We felt right at home. 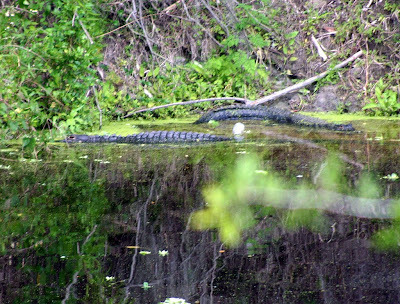 Even the gators came out to greet us! We got a shout of greeting from Jane on the Pickleball courts. We had two visits from fellow datastorm users who get to see us on the Datastorm map as soon as we hookup. 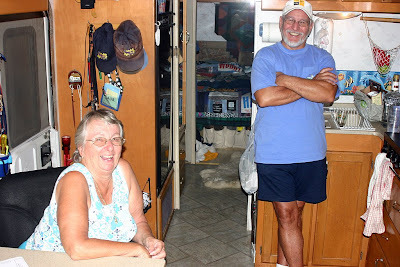 Here are Donna and Bob, fulltime RVers for many years. They have an interesting story on their own Blog. The nature trail is every bit as beautiful as I remember. 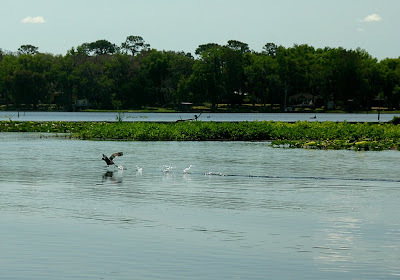 The REAL Florida. We sure missed Debbie though. She was the manager here last year, but March 31 was her last day. After some 20 or 30 years of making sure other people had a good time RVing, she's gone off to RV herself! But her 'recreational vehicle' is a boat. Thank goodness she has a blog so we can enjoy her travels along with her and Richard. Way to go Debbie! They already had a party going on with their 'cosmic cousin' - they tend to meet up using the cosmic planning method! We added to the party when we got an email from blog readers Kathy, Steve and Gail from Orlando. They said since we were going to be in their neck-o-the-woods, could they take us out to dinner. We said "no - come join the party!" So, here's our party - new friends and old - all because of blogs. 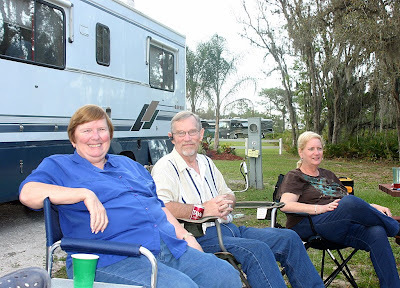 Kathy, Steve and Gail are very active in the Orlando chapter of FMCA, as well as Florida Geocaching Association. We sure had lots to talk about! We will certainly see them on the road again. Gail says she will be at the RV-Dreams rally in Branson in June, where we will be giving our seminars. Thanks for the visit! What Florida is all about ... water and boats. 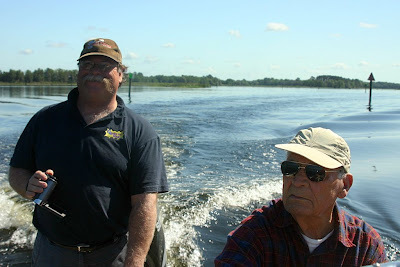 So we jumped at the chance for my Dad to take us out on the water on Lake Rousseau where he lives. Isn't it pretty? Click on any photo above and you'll be at the album where there are more photos. No, I'm not saying that it's boring to be back in Florida. We quite like the place! 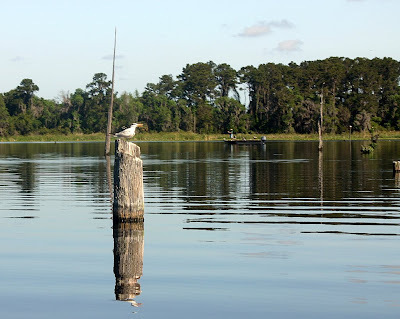 We're parked at Ho Hum RV park in Carabelle, Florida on the gulf coast. 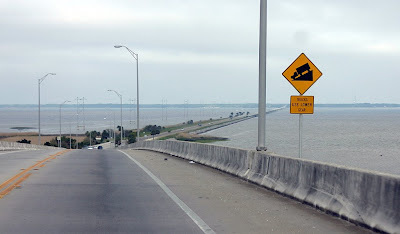 Right *on* the gulf coast! 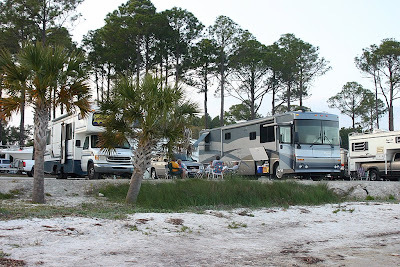 When we ran into our friends Bob and Polly in Arizona - they told us they planned to do some workcamping next winter at a park called Ho Hum near Pensacola. As we were checking out the map of our route from Alabama - we said 'Let's get away from our old wheel ruts on I-10 and take the scenic route this time ... and, look! We could stay at Ho Hum and see what Bob and Polly are going to be doing next winter.' We splurged the $27 to park with our front windshield looking out over the beach. 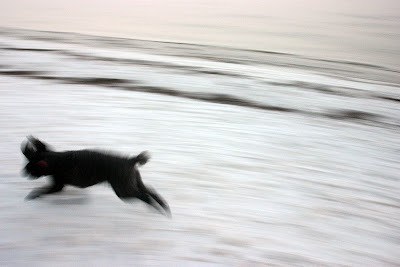 And, Odie just goes berserk running on the sand! 'Taking the scenic route' ain't all it's cracked up to be though. Yes it was pretty, but it took us about twice the amount of time as the Interstate, and it was a lot more stressful. So nice to be seeing water again ... after 6 months in the desert! If I put the following picture into a blog post in November and told you we were in Montana ... I'll bet you'd believe it was snow?! 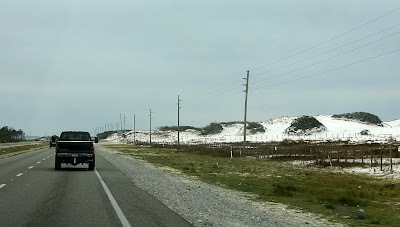 These are the famous white, sugar-sand beaches of the Florida gulf coast. Lots more photos on our Picasa Web Album. You can click on any picture above to get there.